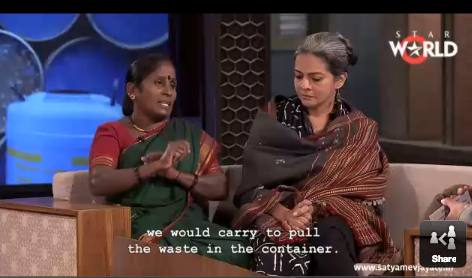 SWaCH Cooperative in Pune, India, appeared on a national television show Satyamev Jayate in March. In the episode “Invisible Environmentalists”, the show’s host Aamir Khan interviews Laxmi Narayan, co-founder of SWaCH and SWaCH waste picker Saru Bai, who now runs a compost plant with her husband. “It’s they who generate the dirt and we who clean it up,” she said, after explaining how society treated waste pickers as dirty. She also spoke of discrimination and harrassment from police, who often accuse waste pickers of being thieves. She describes how her life changed after joining SWaCH and she and other women began doing door to door collection. The show’s host said, “I’d like to thank every individual who works with waste. You are doing an important job. Hats off to all of you,” Khan said.